Girlpool's What Chaos Is Imaginary reckons with internal struggles that demand, but don't often get external confirmation. More often than not, it's successful in its quest to make sense out of transition and disarray. Cleo Tucker and Harmony Tividad have been infusing their deceptively simple guitar-heavy sound with a frank vulnerability since the beginning. 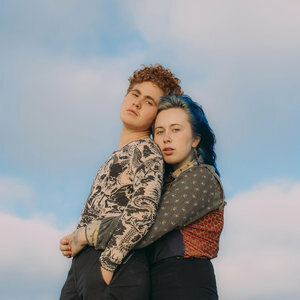 Since 2014, the duo have released an EP and three full-length studio albums under the name Girlpool, and the projects have slowly begun to embrace an ever-widening sonic palette. (A drummer, Miles Wintner, was added for 2017's Powerplant.) But to depict Girlpool's rise only as one of a developing technical virtuosity would be unfair to one of the group's most outstanding traits. Although their earlier records weren't much more, technically speaking, than two guitars and two voices, the sonic influences were wide and impressively fully-formed. Girlpool has always had a punk ethos, especially considering most of their records come in at under 30 minutes, but the shouty, conversational vocal style owes just as much to Kimya Dawson's anti-folk and lo-fi indie rock. And then there are the lyrics, which conjure a frank sense of intimacy in relation to selfhood and personal developments but which, as most good art tends to do, end up transcending their own bounds and speaking to something much larger. In "It Gets More Blue", a track from Powerplant, Tucker and Tividad sing, "The nihilist tells you / That nothing is true / I said 'I faked global warming / Just to get close to you'." The tongue-in-cheek reference to global warming says more about the pair's taste for peculiar songwriting than it does their politics, but what comes of it is all the more potent in its specificity. What Chaos Is Imaginary, the group's fourth LP, carries all of these tendencies forward into a new, more expansive territory. Nearly twice as long as any of their previous projects, the new record makes space for musical experimentation, including the addition of drum machines, strings, and synths. But the lyrics, often veering into the abstract, are as insular as ever, demanding a personalized interpretation from the listener that may, after all, be different from what the writers intended. That makes for at-times frustrating listening, but it's almost always rewarding. Girlpool, more than ever, abound with contradictions: Their unfussy arrangements remain accessible yet unique, and the words hint at both a longing for suburban comfort and a fiery desire for a sort of transitional, transformative experience in an unfamiliar land. The record kicks off with the grungy track "Lucy's", which immediately showcases Tucker's newly deep voice. (Since Girlpool's last record Tucker has come out as transgender and is in the process of a gender transition.) It's a straightforward track and hones in on some of the group's fixations — "Lucy's" could be about the place of a lover or ex-lover, or simply the image of a person too free-spirited to be available. Tividad joins Tucker at the end of the track: "In awe with the medals you burned for someone's heart / A scene I kept dreaming make me swollen then sharp." It's an evocative image, written in the past tense as to bring back the memory of something fuzzy yet persistent. The track "Where You Sink" reaches similar lows, with Tividad mourning the unsatisfying mundanity of stasis. "I know you live where you sink," she sings, resigning herself to the fact that with comfort often comes boredom. "Hire" and "Pretty", two of the record's best tracks, follow immediately after, approaching disillusionment from other angles. "Hire" is much more upbeat, with loose, meandering guitars, as Tucker considers inner thoughts by channeling them onto screens, in matinees and advertisements. As heavier guitars kick in, Tucker's voice reaches a breaking point: "I let it live like a payday of mine / I can't let it be / I'm high scoring memory." Tucker's new voice, reaching the point of outright yelling here, is an unfamiliar sound for Girlpool, but it's tremendously exciting. It also happens to be one of the most gripping moments on the whole record. "Pretty", another excellent track borrowing its title from 2015's Before the World Was Big, achieves the same effect with a simple guitar riff that comes in just after the chorus. In these two tracks, Girlpool is a force to be reckoned with. Most of the remaining songs are quieter but no less successful. "Chemical Freeze" features a fizzling drum machine beat that sounds like nothing Girlpool has previously released, while "All Blacked Out" trades familiar vocal harmonies for simple, echoing guitar licks and soft reflection. The title track, "What Chaos Is Imaginary", is the album's languid emotional centerpiece. "Everything's overrated", Tividad croons. Her voice swells as the instrumentation slowly unfolds, revealing synths and strings. It's a surprising track, seemingly very unlike Girlpool in sound and composition, and yet its central question gets at the heart of everything Tucker and Tividad have explored so far as songwriters. What Chaos Is Imaginary, both the record and the song, reckon with internal struggles that demand, but don't often get external confirmation. Whether through transition or the very apocalyptic sort of existential reasoning that comes with adulthood, the record cherishes memories of the past, comfort and simplicity, all while bracing for an unknown future. Although willfully murky in a way that occasionally verges on the indecipherable, it's a wondrously open-minded record that treats all experiences, good or bad, as ripe for artistic sublimation. If life is chaotic, Girlpool are its poets, watching, waiting and dutifully recording its most poignant moments.